"The reason I have used and continue to use Steve is not just because he does great work, but because he does what he promises and on schedule. You can always be sure it is done right." "I want you to know you have an exceptional business in the automotive/consulting field. Your calm, patient manner was a great help to me throughout the entire process. Your knowledge of the industry and remarkable abilities to see things from start to finish are rare indeed. From this point forward, I will exclusively use you and your company for any and all automotive/consulting service(s) for myself as well as my client base. Once again thank you and I look forward to working together in the future!" "The purpose of this letter is to inform the recipient that PMT has utilized your services for a number of services. These range from window tinting, radios, etc. Another added benefit is Steve assists us in keeping an inventory of glass and other goods we require keeping our fleet operating its 2.9 million miles a year. Steve himself conveys the same pride in his work as we do in our fleet. Steve recently has offered a one stop Shopping approach. This has included paint and paintless dent removal. Year to date we have had 6 ambulances needing total repaints; all were done in a very timely fashion with unequaled results. As far as the paintless dent removal and touch up program, we have not had to do as many repaints as in past years giving us a net savings. PMT has had a business relationship with Steve over the last 7 years. In this time there has never been an unresolved question or issue. This I cannot say about all my vendors." "Since my first tint job with your company in 1999, I knew I would never have to worry about finding another automotive source for my vehicles. From simply pin striping my Lincoln Navigator to customizing my Dodge Viper GTS, Steve and his associates always did the job to the highest standards and also stood behind their work 110% (I have even won car shows courtesy of their impeccable work!). I have since moved to England and still use this company for consultation and ordering parts for my vehicles as they are by far the most experienced and honest people I have come across. The best part is . . . Steve is only a phone call away . . . unlike the large corporate companies where you are put on hold or being passed around from one department to the next to no avail. I am a car fanatic and it's great to know that this one company can do it all! Keep up the great work guys!" "I have known Steve for over ten years now and I cannot say enough about him and his company. Steve’s dedication to customer service has always exceeded my highest expectations. From my first small tint job to my wife’s Yukon Denali XL which included, tint, wheels, tires, back up camera, and mobile home theater set up with surround sound, Steve’s attention to detail is superior!! Steve’s knowledge also showed through on my 1968 dodge coronet R/T show car when he measured for wheels and tires and was able to get a size 50 tire on the rear axle WITHOUT tubing the car, simply amazing! Not only do I get great complements on the tire and wheel set up, the tint on my show car always brings attention. My 2007 Dodge Mega cab is the latest vehicle that Steve and his company have customized and I cannot be happier with the work! If you are looking for quality and I mean quality workmanship and aftermarket parts, Steve is your man!! Look no further!" International Real Estate Consultant "Live The Dream"
"From the day John O. told me about you I feel that my own "auto guy" search is complete. Everybody gets a ding or a scrape in their daily drivers, but when your daily drivers are high Line cars and trucks, it hurts. Frankly I know the dealerships send their work out, the key is finding the people they send their work to and go direct. Thanks you so much for being my trusted advocate with regard to my vehicles…Windshield replacement, tint on my Cadillac, Lexus, BMW and insurance inspection on my SL500. All done with over the top service, price better than the big boys and TLC as if it was your own. Hope I don't need you soon, but I won’t hesitate to call when I do." "I just wanted to convey my appreciation for the bodywork that you performed on both my personal and company vehicles over the years. It is unfortunate when a vehicle is damaged but it is comforting to know that you will make it look great again. Your professionalism and knowledge of your business is truly reflected in the quality of your work. 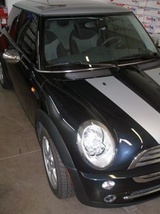 I will never use another company for my bodywork, window tint, or aftermarket needs." Based at the Scottsdale Airpark we also serve all of Phoenix, AZ and surrounding valley communities so call 602.524.0807 or contact us as we want to know about your Car Guys of Scottsdale experience too! Serving Scottsdale, Phoenix, North Scottsdale, Tempe, North Phoenix, Cave Creek, Carefree, Paradise Valley, Fountain Hills, Arizona.